Fat and Happy Food Blog Tips and Techniques: Using port gives the cake and frosting a deeper cherry flavor, but you could substitute the cherry juice from the jar of cherries as well. Port is a strong, sweet, fortified wine typically enjoyed after evenings meals. Preheat to oven to 350 degrees. Place the cherry filling, port and cocoa powder in a food processor or blender, process on high until the mixture is combined and the cherries are finely chopped. Set aside. Cream the butter and sugars in a stand mixer (or by hand). Add the eggs one at a time, mixing well after each addition and scraping down the sides of the bowl if necessary. Sift together the flour, salt, baking powder and soda. Mix the cherry mixture and the flour mixture into the creamed butter, alternating half of each mixture at a time until well mixed. Add in the chopped chocolate last, mix just to distribute. Pour into well greased pans, bake until an inserted toothpick comes out clean. For a full size cake, use two round cake pans; the baking should take about 30 minutes. Or try a bunch of smaller, more individual cakes. Fill small molds about half full; cooking time should take less than 30 minutes. Keep a close eye on them, you will begin to see the edges pull away from the sides. 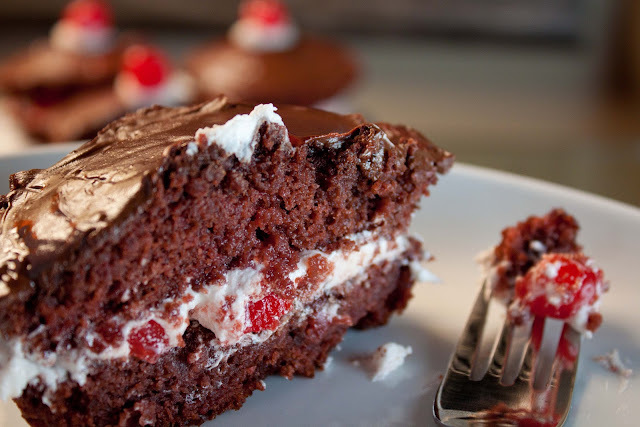 Make the frosting and cut the cherries while the cake is baking.To finish the cake, layer the frosting onto the top of one round cake (save just a little dollop for the top of the cake.) Place the cut maraschino cherries on the frosting and top with the second cake layer. 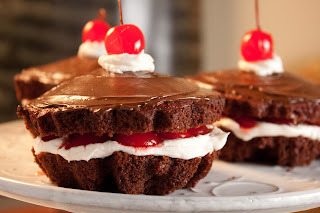 If you make smaller, individual cakes, simply cut the cake in half and place the frosting and cherries between the layers. Spread the top layer of the cake with the melted semi-sweet chocolate. Add the final dollop of frosting on the top of the cake along with a cherry or two. Using a hand held blender or stand mixer, whip together the butter, powder sugar, port and almond until it is light and fluffy. If you prefer a stiffer filling, add more powder sugar until desired consistency is reached. Remove the stems from the maraschino cherries and cut them in half. While decorating, I held the cherries right over the cakes and cut them in half with a small paring knife, allowing all the dripping cherry juice to soak right into the cake. It's a little messy, but gives the cake a little extra flavor, moistness and more yumminess. Yum, looks beautiful and very yummy! I just made chocolate covered cherry cake... Lovely! I used this recipe to make cupcakes with cream cheese icing for a baby shower. They were a huge hit, and my husband devoured the leftovers.